Band performance times and details for the official pre-party for the ninth annualWelcome To Rockville are now available. On Friday, May 3, Saturday, May 4 and Sunday, May 5, Florida’s Biggest Rock Experience takes over Metropolitan Park along the St. Johns River in Jacksonville, Florida with must-see headlining sets from some of the biggest names in rock including Tool, Korn, Rob Zombie, Incubus, Judas Priest, Evanescence,Shinedown, Bring Me The Horizon, Chevelle, Circa Survive, Yelawolf, Meshuggah and many more. More than 50 bands will appear on three stages over the course of the weekend. A limited number of General Admission and VIP tickets, as well as camping passes, for Welcome To Rockville are still available atwww.WelcomeToRockvilleFestival.com. Note: VIP Weekend and VIP Sunday tickets, as well as hotel packages, are now sold out. 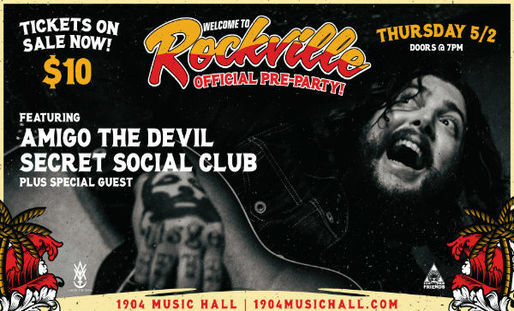 Welcome To Rockville Presents The Official Pre-Party featuring Amigo The Devil, Secret Social Club, and a special guest will kick off the weekend on Thursday, May 2at 1904 Music Hall in Jacksonville. Doors open at 7:00 PM, and the first 100 Welcome To Rockville single day ticket or weekend wristband holders will get in free. For those needing to purchase tickets, general admission is only $10 and tickets are available atwww.1904musichall.com. In addition to performances from top music artists, and various onsite attractions, attendees will also enjoy a variety of onsite food and beverage options provided by Southern Hospitality Concessions LLC, DWP’s affiliate concessionaire. 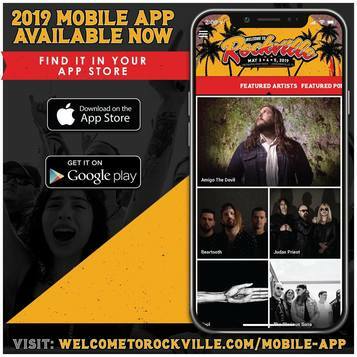 Visithttps://welcometorockvillefestival.com/experiences for the full list of offerings from local and regional restaurants and food trucks. Fans 21+ can wash down Welcome To Rockville’s over-the-top food offerings with a variety of beverages, including Bud Light, selections from the Caduceus Cellars & Merkin Vineyards Wine Garden (owned by Maynard James Keenan, co-founder of international recording acts Tool, A Perfect Circle, and Puscifer), killer cocktails at theKraken Black Spiced Rum Heavy Tiki Bar oasis, and local craft beer, including options from world renowned Tampa-based Cigar City Brewing.